I have been moving from my apartment to a house, and it has been grueling. Seems that I have more stuff and a less agile body than I have had in previous years when I took on this task. Anyway, I needed to take a break and be creative the other night, and this is what arose from my drawing pad. I had a number of suggestions from Facebook friends of things to draw, so I will consider them the next time I need to take a break. I am posting the drawing for auction. The auction is short lived, so get your bids in fast and watch closely! Enter your bids in the comments below. BUY NOW OPTION: You can buy this piece now for $70 as long as no bids have been made in the comments below. Simply write BUY NOW in the comments and send a payment of $60 + shipping via the ChipIn widget in the right sidebar. Highest bid at 10:00 pm EST on Saturday 3/9/13 wins the piece. Winning bidder: make payment of bid + shipping to PayPal to Paypal using email address bztat at bztat.com. It's a Hippie Peace Piglet! Whether it is Wilbur from Charlotte’s web, Babe from the popular movie “Babe” or the more recent superstar, Maxwell the Geico pig, there is something very endearing about young pigs. So, to follow my series of Hippie Peace Pets, today’s painting is a Hippie Peace Piglet! I am posting this painting for auction. The auction is short lived, so get your bids in fast and watch closely! Enter your bids in the comments below, and be sure to identify your bid with the painting’s name. BUY NOW OPTION: You can buy this piece now for $125 as long as no bids have been made in the comments below. Simply write BUY NOW in the comments and send a payment of $125 + shipping via PayPal to bztat at bztat.com. 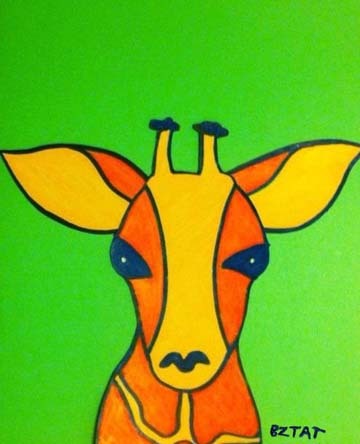 Highest bid at 10 pm ET Tuesday, February 19, 2013 wins the piece. 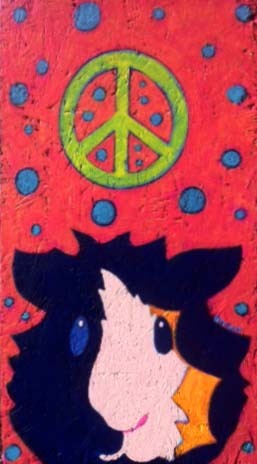 My Hippie Peace Cat paintings went over very well, and my Hippie Peace Pups and Paws were quite the hit as well. I have lots of friends who have Guinea Pigs as pets, so I thought I would try my hand at painting one. I have to admit, it was a lot of fun painting this little critter! I am posting this two painting for auction. The auction is short lived, so get your bids in fast and watch closely! Highest bid at 10 pm ET Monday, February 18, 2013 wins the piece.